Human Food That is Safe (And Healthy) for Your Dogs! We all like to give our dogs’ treats or even some leftovers from dinner. Or sometimes you want to make or share something you’re snacking on with your dogs and aren’t sure if it’s safe for them. 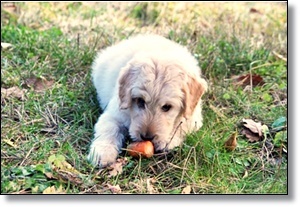 There are many human food items that are good for your dogs and can even be a nice addition to their diet. Of course, each dog is different, so always start slowly with any new food item to see how your dog reacts. Salmon is a fatty fish which is also a good source of omega- 3 fatty acids. These fats support the immune system and can be beneficial for your dog’s skin and coat. There has also been some indication that they may benefit dogs with allergies. You can feed salmon or salmon oil. If feeding salmon, make sure it’s cooked before serving, as raw salmon can carry a parasite that can make your dog sick. Sweet potatoes are a great source of fiber. They also contain vitamin B6, vitamin C, beta carotene, and manganese. Sweet potatoes are great sliced and dehydrated as a chewy treat for your dog. They are known to help with your dog’s digestive issues (as is pumpkin- also listed). To read more on this story, click here: Human Food That is Safe (And Healthy) for Your Dogs! Did You Know These 30 Foods Are Harmful To Dogs? Why Do Dogs Smell Each Other's Behinds?